The current seminar group that was guesting in the house, a yoga group who had booked part of the house for a special week for sessions of laughing, screaming and dancing/singing (among other things), was leaving on the morrow. They’d spent the day at points all around the lake, as their special focus was water for this visit. After a meal and happy conversation when the special mood of the moment hit they began to sing, playing instruments we have here: sitar, Native American flute (that I brought), a drum, maracas and a rainstick. I thought of the book by Maurice Sendak, Where the Wild Things Are, when they rumpled and roared, and rumpled and roared. I retreated upstairs, two levels, after I’d sung a few songs from my tribe, letting them finish their moment of epiphany and farewell. I’d been transfixed by the movement of the treetops earlier in the day, how rhythmically they moved against the blue of the sky, almost lazily. Hypnotic. I’d been listening to the music of Nusrat Fati Ali Khan, and after several minutes of clapping and nodding, that moment had hit for me when my body, mind and heart were all in perfect unison separate from my consciousness. I could think and ask myself questions, ask the universe, listen to what my son was saying to me all disconnected from my body as it continued moving in time to the music. If you’ve never experienced it, I can’t say you should, but it is magnificent to get that rhythm, if only for a matter of minutes, that sends you into a spasm of delight. Nothing and everything matters. You feel it all yet are empty and happy just in the energy of pure sensation. Your body is heated up and you felt the temperature rise each degree. I was coming off that totally natural high when I’d heard them below, joined in for a while, then came back upstairs and opened a window that looks out over the long backyard and down to the lake. I could see their jumping shadows on the grass and hear their ecstatic, joyful voices as they called to each other, the thump of their bare feet on the wood floor of the downstairs living room and kitchen, all open to the night. With a final deep voiced cry, the leader concluded the dance. Quick steps began, pattering down the deck, the rain stick making an insect slithering sound, a rattle and beady trickle answering the crickets in the long grass. Lighter steps on the stones leading down the slight grade to the fence, and then beyond into the forest. Is a certain kind of echo that results with living so near the lake that causes this. Some sounds have perfect clarity, others are dull and void. A voice calls back, “Oh yes I do!” And everyone laughs again. They are headed to a little point just a minute or two’s walk through the forest where they will have a small bonfire, probably sing and dance again, or possibly strip and wade into the cool waters of the lake. I have an image in my mind of the time after a sweat lodge I was a part of here in Germany. We’d gone in during a stormy time, but by the time we were out again the winds had calmed and a layer of snow dusted the land. We stood naked beneath a purplish sky and rubbed our naked bodies down with icy water. A time of bonding. So, I tell myself, probably mosquitoes, hundreds of them are drifting in over my head through the open window. I close it finally for now its dark nearly total after they’ve passed to their place. I go back to my room and find different music to play. I choose a CD I don’t often play because it’s so deeply emotional, not for its content exactly, but because I’d listened to it before with my mother, and she’d told me the stories again of her growing up. Of coming to town on Saturdays in their mule drawn wagon and seeing the white men buck dancing at the general store as others of their kind sat and played checkers, shared the latest gossip and made a note of everyone who came by. The soundtrack from “O Brother, Where Art Thou?” Track 17. That’s the kind of music they played as the man clacked his heels and danced on the square of board. “Yoga hippies” dancing in the woods, bluegrass/redneck/old-time Southern buck dance music and Nusrat Fati Ali Khan, that’s this place. My friend and I have a few squares of dark chocolate for a bedtime bite along with a few glasses of bio red wine (extricating a few gnats who’ve decided to imbibe) before I wrote this. Then I listen to track 18 and think of my mother describing her first time in a church and how terrifying and strange it was. I had decided to work on my memoir tonight. I’d been stuck for months because of the next section, a particularly emotional part that details a series of events than led to a time of great darkness and agony for me. But this is all a symbol. It’s okay. I’m going to be okay, just as I told myself a thousand, thousand times as a child when I had to. With all the jarring, harmonious, strange ordinariness of the past that has created the totality of current self, we can only go forward trying to be the best we can be and enjoy the times and people we meet along our path. 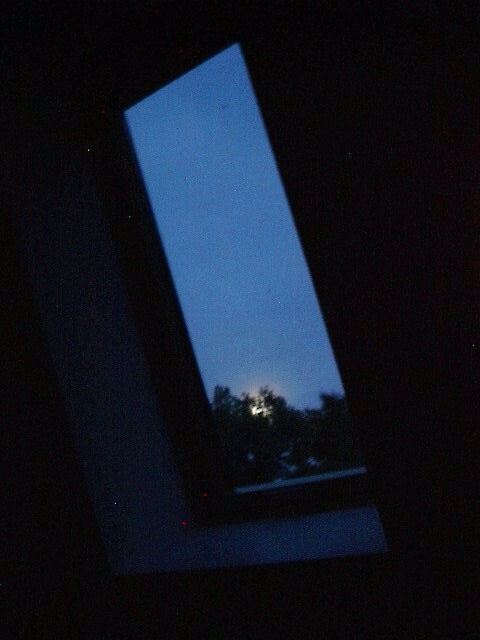 Not the best photo, but that’s the sky here, this night, four am. Posted in Berlin, Germany, Personal Entries, Travel, Writing and Writers. Tagged berlin, germany, hippies, memoir, memories, red haircrow, travel, yoga, yoga seminars. Next: Next post: Indie Publisher-“Flying With Red Haircrow” Site Now Up!